What's the correct Hight for a Sringpole ? Iv seen a hand full of Vids and alot of them the dogs aren't even touching the ground ! At that point the spring is just a waste, you might as well just have the dog hanging from a rope. I'm planing on using a chain around the branch, this way with the chain I can adjust the Hight (with a D ring) . I think I'm just gonna set it up so she has to jump for it and pull it down with her body weight on to all fours's..... This way she's Actually pulling. Iv seen very few Vids when the dogs have all fours on the ground. but when I do the dogs aren't really pulling back much with the Front legs,, it seems like it ALL back legs pulling. To me that seems like the right way to have it set-up. What do you guys think? Not sure if i should have posted this in Equipment But thanks for any help:). And I just built a flirtpole but the way this dog is jumping and landing dose scare me.. A friends dog heart her leg really bad jumping after a stick,,, and had a huge knot in her leg for the rest of her life. Another reason I don't think she should be hanging!! And the way she's jumping after the flirtpole,,, she's doing inverted flips !!!!! I try to get her just to chase it ( in a big Circle ) but at some point she ends up leaping for it. Thanks again..
Re: What's the correct Hight for a Sringpole ? I don't think there's a Correct Hight but just wanna know if the dogs feet should be on the ground ? 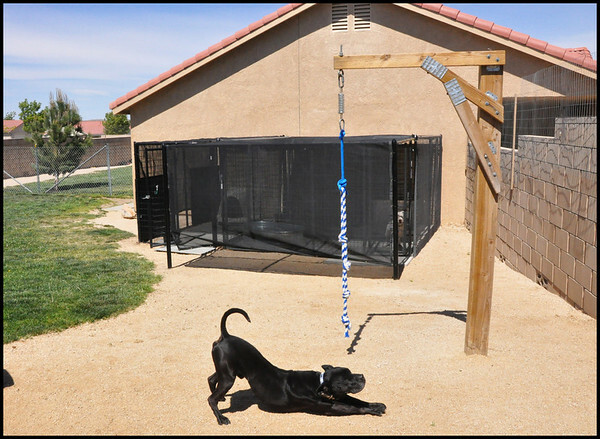 You'll here a variety of opinions, but the dog being able to keep feet on the ground minimizes the risk of injury. i think the correct height depends on the height of the dog. I have Peanut's to where all 4 of his feet are touching the ground. that is not to say sometimes he stands on his back feet sometimes but his toy is literally 2 feet from the ground. im sure i sound like an idiot here for this, but what exactly is the point of this? like what does a springpole do...is it just a toy or an exercise or ...? Ours is a bit lower than Red's. Definitely feet on ground, to prevent injury. We have ours so that the dog has to jump for it, but when the weight of the dog is on the rope/spring the back two feet are on the ground. From personal experience this may not be the best option for everyone. Maybe all four feet are better. Because----One of our dogs broke her leg using the spring pole. My husband was really getting into it and was pulling the rope down (with her) and lifting it up while she was on it, causing all of her feet to come off the ground completely, and then all four to land back on the ground. One of the times she came back down one of her front legs landed wrong and snapped. So there is the risk of injury and you need to determine what risk you're willing to take with your dog. Some people need to tone it down on the enthusiasm (my husband) and some people need to tone it down for the dog-sounds like this may be your case Iwata since you're worried about how your dog is landing. I use my spring pole for my malinois, not my pit bulls, generally but I tend to allow them to both hang and stand and pull. My male malinois loves to jump and swing. As a rule though I would encourage some feet on the ground. Red... Do you have any trouble with the pole being so close to the springpole ? (it looks kinda close,with the front legs) Would you set the Sringpole back a lil further, if you had to set it up again ? Iwata_Graffiti wrote: Red... Do you have any trouble with the pole being so close to the springpole ? (it looks kinda close,with the front legs) Would you set the Sringpole back a lil further, if you had to set it up again ? No, because i would have to use a longer pole on top, which would make things weaker and put more pressure on the eyehook on the edge, which is where I put my spring and the biting surface. The blue material you see under the ducktape is a thick foam padding.If the dogs hit the pole they were protected. I did it because at the moment I was letting my girl Tigger swing, so I wanted to make sure she would not get hurt.I lost that baby last year and the dogs that use the pole now I don't let swing much. Also, I don't have pics of it but I had a safety chain connected to the vertical pole, in case the eyehook came down under pressure.Kinda hard since it is screwed in and bolted but you never know. What kind of spring is that? I use garage door springs, and I would like to have a shorter set-up but those springs are too long.